The moment a pet enters a grooming salon there is a special relationship between the pet and groomer. Clients look for groomers that are knowledgeable, care about their pets and offer a clean safe environment. Care and safety should be a priority during the grooming process. The “hands on the pet policy” continues to enhance that special relationship. A well-trained groomer can feel a pet’s reaction, and always keeps a hand on the pet too steady and make him feel secure while grooming or bathing. For example, continued physical contact with a pet during the bathing process steadies the pet when their normal reaction would be to jump out of the tub. Control of the dog in the tub avoids water spraying directly onto the face resulting in nasal infection or eye irritation. If the pet is nervous, a groomer’s hand can reassure the pet. 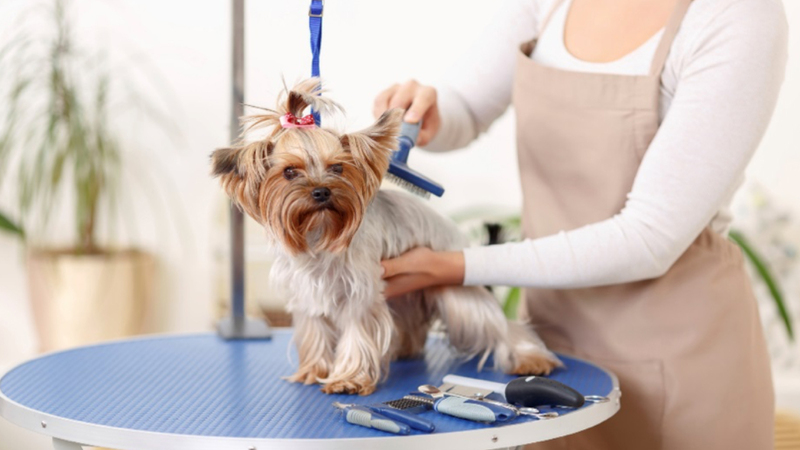 If the pet is going to jump, the groomer will feel the body movement and prevent an accident. When using a force pet dryer, keeping a hand on the pet will provide security and help direct airflow. Helpful Hint: When drying a pet, keep the nozzle of the dryer close to the pet using back and forth movements to control the direction of the airflow for fast drying. Rose has owned and operated 12 grooming salons. She has shown top show dogs and bred many champion litters.